You've scoured the internet searching for something that will provide the kind of service your customers are screaming for... but until now it's been too costly and complex to set-up. How can you provide first-rate customer service quickly and easily without breaking the bank? Maybe you're still fumbling around with Gmail or Outlook as your central support hub and you're overwhelmed by the sheer volume of support requests filtering through to your inbox. Or maybe you're simply sick and tired of answering the same customer support questions over and over again. You've heard for years that a dedicated help desk is the way forward to dramatically improve customer satisfaction rates, boost repeat purchases... all while saving time and cutting support costs. But until now you've found making the switch too time consuming and complicated. Create a truly awesome customer service experience. eStreamDesk instantly transforms your out-of-control email inbox into a well-oiled customer support machine. Every incoming email is automatically converted into a support ticket. You define exactly how each and every email is prioritised, monitored and answered. Imagine having the ability to fully automate your email flow. Route sales emails to your sales team, route technical emails to the tech department. Trigger automatic email replies to the most commonly asked questions from your customers. You define exactly who gets what email based on the work-flow rules you set. The built-in intuitive work-flow rules give you unparalleled flexibility in creating a robust support system that's second to none. The rise of social media has given every single one of your customers a voice... your reputation hinges on how quickly you communicate and solve your customers problems. That's why we've added full Facebook and Twitter integration into eStreamDesk. With the click of a button you can fully integrate both Facebook and Twitter into the helpdesk. Every Facebook post, every tweet converts to a support ticket just like email. Picture how much time you'll save with this feature alone. No more madly scrambling between your inbox, Facebook and Twitter and you'll never forget to answer another query on social media again. But that's just the start of the benefits to you and your business with eStreamDesk. Fact is, we built this software to save you money, leverage your business growth and save you time. Time you can otherwise spend with your family, dedicate to your hobby or simply hang out with friends. Don't waste hour after gruelling hour in front of your computer on tiring, repetitive tasks when eStreamDesk can quickly and easily do all the heavy lifting for you. Great for tracking items that could normally be lost in a paper or email shuffle. In the information age, patience is a sparse resource. People want an answer and they want it NOW. Your customers are no different. Timeliness is the essence of excellent customer service and sometimes waiting for an email reply just won't cut it. A recent study has shown 44% of customers made a purchase based on chatting live with a support agent. That's too big of a figure to ignore. So when you join eStreamDesk you'll be able to access our live chat function. Talk to your customers directly from your website, live and in real time, just like chatting over Skype. If you find yourself and your support agents are answering the same types of product or service questions over and over again, your wasting time... a lot of time. Let eStreamDesk take care of this for you. Imagine having a highly targeted, information rich knowledge base all your customers can easily access to answer their own questions WITHOUT sending a ticket. All of this is possible with eStreamDesk, by sending automatic responses to common questions. We're here to increase your customer support efficiency ten fold at a fraction of the cost. This means less work, less worries, happier customers and more money in your pocket. We take a minimalistic approach to web based helpdesk management. You won't find a cluttered interface or a bunch of useless features. eStreamDesk pulls you from the dark ages of manual, labor-intensive customer support and introduces you to a world of delightful automation. The knowledge base and the ticket numbering, monitoring is great! Thanks for putting this together. It took barely no time to integrate to our site and our clients have been using it. I've been looking for an offsite support system for my clients and this is perfect. It'll save me the trouble of setting up another server just for support and it handles all the email. I haven't seen anything else that compares. You can keep on fumbling around with Gmail or Outlook, scrambling around to find customer history or email conversation strings. You can continue to waste hundreds of dollars each year on an overpriced helpdesk where half the stuff you pay for you don't even use. You can keep your head in the sand and continue to lose customers, lose money and potentially your business as well. 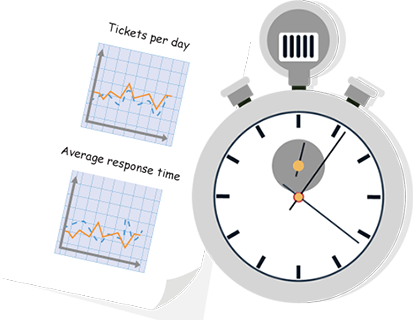 All at a fraction of the typical costs associated with support ticket systems. Start your 30 day eStreamDesk trial today and plug in to a whole new level of customer service. You've got nothing to lose. Simply click the button below, provide your details, then we'll send you an email to get you started.